Hi EPaperie fans!! 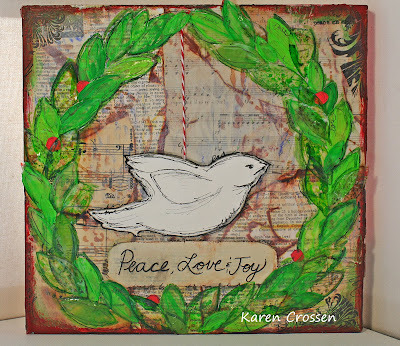 Today I am sharing with you my holiday Peace Dove Wreath!! 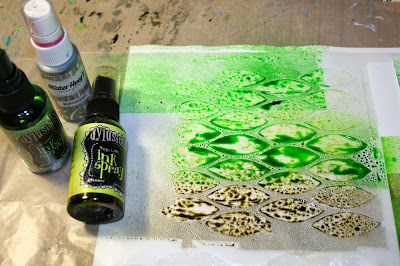 I went all crazy with the Wendy Vecchi Embossing Paste and loved how much fun I had playing with it!! I had done this technique with modeling paste before and I thought, hummm, wonder if the embossing paste would work too . . . and it did!! 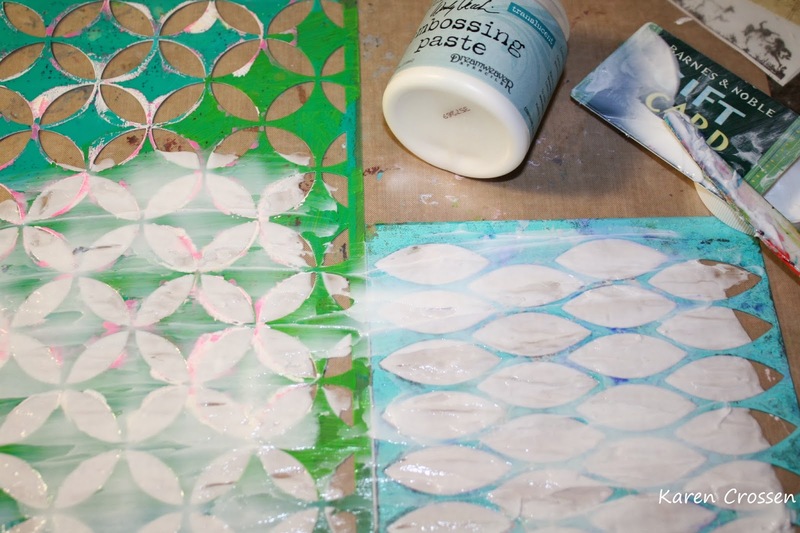 I started off with some wax paper and stencils. 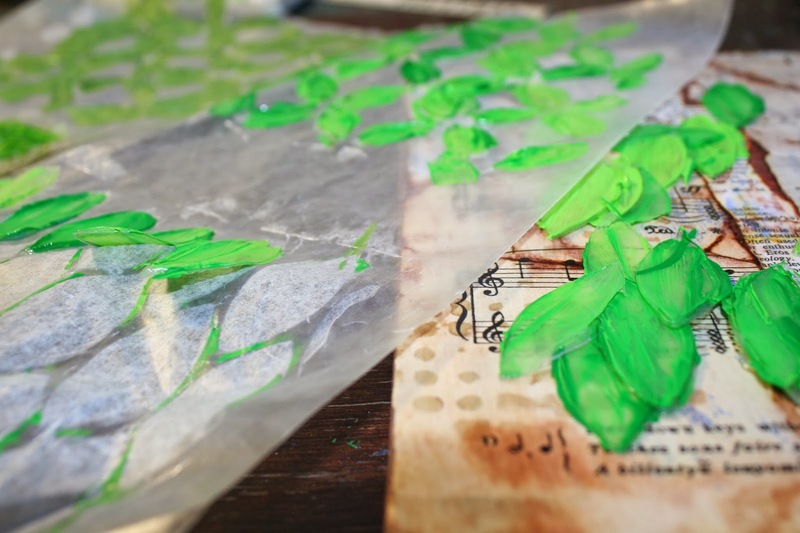 I smeared Wendy Vecchi's Translucent embossing paste into the stencil, onto the wax paper and carefully pulled the stencil away! Then I colored it two ways, half with Dylusions and half with craft paint, to see what would happen! 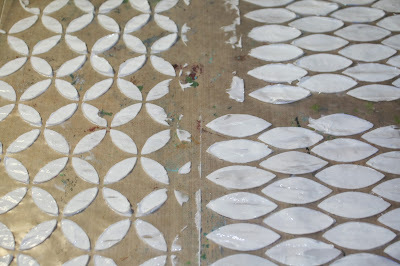 And I love the result with each medium because they both turned out so differently! After the paint and spray were dry, I peeled the shapes off the wax paper! They held their shape and were really durable. The painted ones were more rigid. 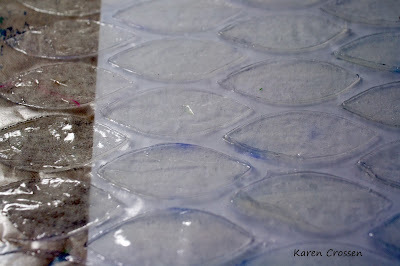 The Dylusions sprayed ones were soft and bendy! So I took out a piece of wood, some paper, distress ink, some more stencils and made a background for my wreath. 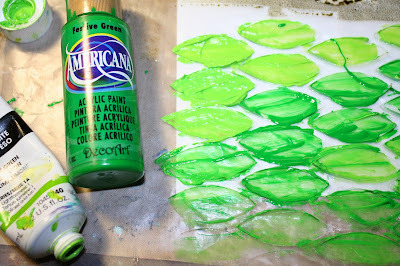 After arranging the embossing paste leaves into a wreath, I knew I needed something else in the middle! 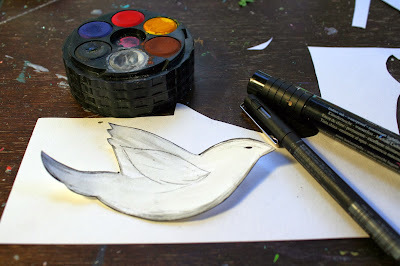 I sketched and water-colored a peace dove! Then I used some twine to 'hang' it from the wreath!! I hope you have some fun playing with stencils and Wendy Vecchi's embossing paste!! 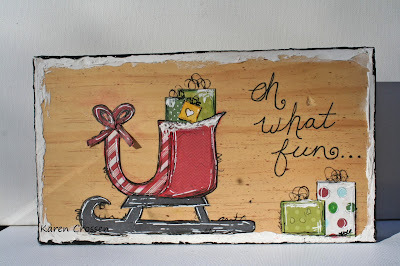 And as a bonus fun project, I turned my eP Watercolor Challenge from last week into a wood and paper piece project with my Simple Stories December Documented paper! Karen, these are so cool. I love the way you made the leaves for that gorgeous wreath. I haven't seen that technique either and it has so many possibilities. The dove is lovely suspended in the center like that. Thanks for the bonus, too. very inspiring ideas. This is pure genius, Karen! Now I have to run to my studio and start playing with embossing pastes! What a great idea! Beautiful projects!! Hi Karen! I LOVE your cards! So creative. I just bought some of that paste and you've inspired me to use it! WOW! Karen, I have never seen that technique before and I can't WAIT to try it! 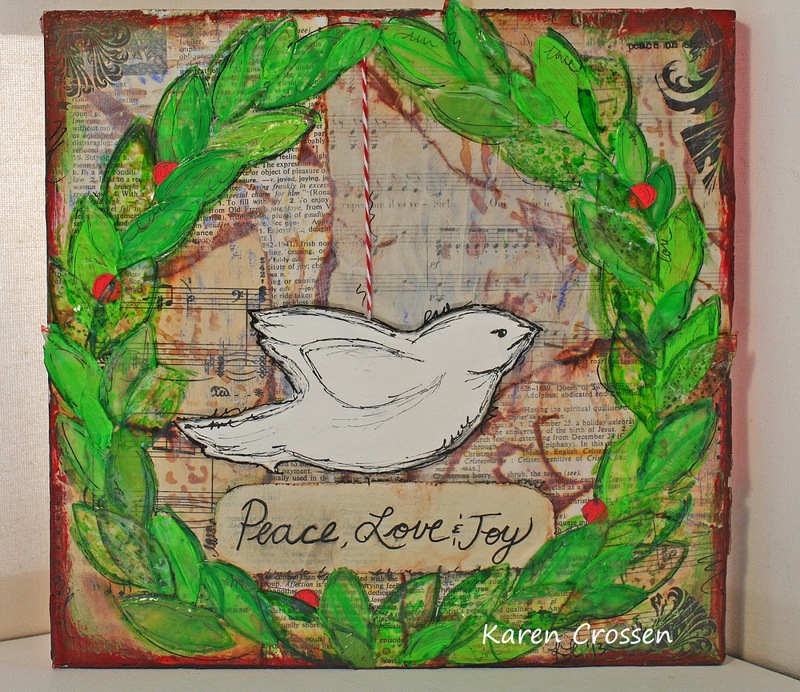 Absolutely GORGEOUS wreath and dove! FAB creation! LOVE what you created with your watercolored project, too! wow! You are amazing! awesome project! Love love love Karen from the wreath to that stunning wood art..mmmmmmm!!! 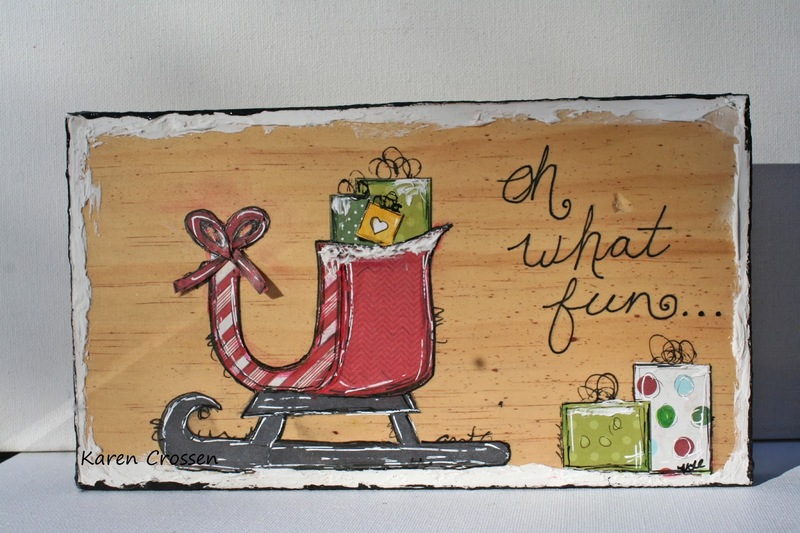 These pieces are FABULOUS for Christmas. You are so artsy!!! !